Despite evidence showing that wild urban nature is necessary for a healthy urban ecosystem, Helsinki’s new master city plan has many of these areas marked out for dense building. With an estimated 250,000 new residents to have arrived in Helsinki by 2050, the city is under pressure to provide homes for them all. While this is a challenge, it is possible to accommodate this number and more without losing the wild urban forests, coasts, islands, wetlands, meadows and other areas that help make Helsinki one of the greenest and most liveable capital cities in the world. It’s all a matter of smart urban planning. A final decision on the overall master city plan will be made in 2016. So if you want to ensure that our wild urban spaces are protected for future generations, now is the time to get interested in town planning! City planning is based on the Land Use and Building Act. 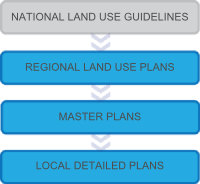 Finland's Environmental Administration website explains that: ‘The principle of the land use planning system is moving down the hierarchy towards more specific plans, so that national land use guidelines steer regional and local master plans, which, in turn, control local detailed plans'. You can familiarise yourself with Helsinki’s planning and participation process on Helsinki City Planning Department’s webpages. You can also track various stages for different areas on the city's Helsinki New Horizons marketing website, but the majority of planning information is in Finnish and requires some searching. 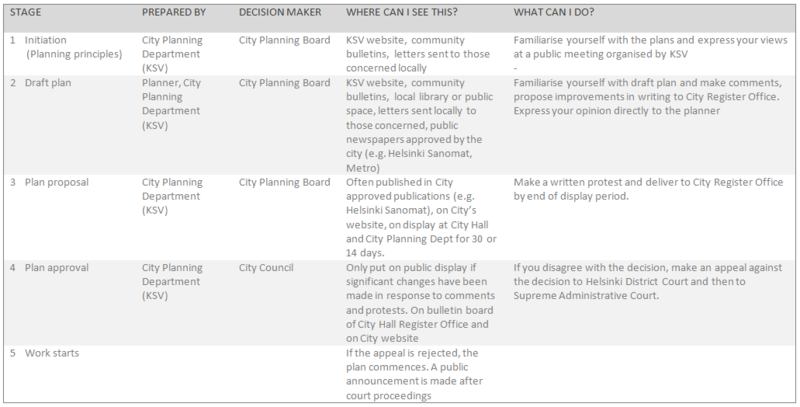 Below is a summary of the city's planning process showing at which stages you can get involved. Picture: Table compiled using material from Helsinki City's website. The most important thing to note is that once the plan gets to the city council stage, improvements can no longer be made, so the city council either has to approve it as it is, or reject it completely. Decision-makers often end up justifying plans, even those that threaten large areas of urban nature, by the fact that there is no better alternative on offer. Therefore, the best moment to get involved is long before the plan makes it to this stage, or even to the city planning board. It IS worth participating at the very least because it opens up different perspectives on city planning and introduces you to others who share your concerns or interests. Laituri, the city planning department's exhibition space, regularly organises workshops on urban development and planning. Even commenting on the city planning department’s plans or policies online, or on alternative visions created by citizens, counts as participating. With others, of course. You yourself can start to draft a better, greener and wilder city. If you can present a sufficiently interesting, well thought –out and realistic alternative to the prevailing urban plan, the direction of development may change. These kinds of efforts have already been made and are currently pending. Östersundom’s alternative plan, which concentrates on more ecological land use, has been devised by environmental organisations in Helsinki, Vantaa and Sipoo as well as Uusimaa. A set of Aalto University School of Architecture researchers and students, together with local residents, developed an alternative partial master plan for Meri-Rastila. Their OURCity plan accommodated a greater number of new residents for the area than in the City’s masterplan by concentrating new building around existing services and infrastructure. This would have left Meri-Rastila’s forest untouched. Unfortunately in December last year, a slight majority on the city planning board voted for plans to build on the forest area. The Finnish Association for Nature Conservation's appeal is still being handled. Meanwhile, Urban Helsinki, a group of architects, urban researchers and urban activists, have created an alternative master plan, Pro Helsinki 2.0, for the entire city. It shows that it is possible to accommodate more than the estimated 250,000 new arrivals while keeping existing urban wilderness in tact. This plan has been met with a positive response from the city planning department. You too can share your opinion on the alternative master plan.